In today’s stress-prone world, it’s critical to lower cortisol levels in your body, protecting yourself from hypertension, weight gain, fatigue, and a lack of mental sharpness. Stress is omnipresent, it seems, in today's hurry-up world. We handle it better if we can lower cortisol levels; our post describes several lifestyle changes that will help you get there. In today’s “hurry-hurry/we-need-more” society, stress runs rampant. As stress builds, our bodies react—we gain weight and belly fat, our blood sugar and blood pressure both rise, and we feel tired all the time, often battling depression. And all of that just stresses us more! We need to decrease stress and get normal again. More specifically, we need to lower cortisol levels in our bodies. Cortisol is a hormone released by our adrenal glands when we feel stressed, so our body is on alert and ready to do battle. That’s why it’s called the “stress hormone.” Cortisol is a good thing. It helps us think quickly in times of danger. The more stress we feel, the more cortisol is released. However, our bodies weren’t designed to be under constant stress. Our bodies naturally lower cortisol levels during normal times, although situations are increasingly few and far between. The result is that cortisol continues to flood our bodies and gets out of control. If we want to combat the physical damage stress does, we need to find ways to lower cortisol levels. Getting cortisol under control is far from a matter of adding another drug to your medicine cabinet. It takes a lifestyle change. Fortunately, usually you can lower cortisol levels without switching jobs or spouses. All you have to do is take charge of your life. Here are some tips on how to do so. Avoid sugary, starchy foods. Look for fresh fruits and vegetables to help lower cortisol levels. Add fiber to your fare. Choose lean protein sources, like beans, pork tenderloin, extra-lean ground beef, and quinoa, which is a grain known to be a complete protein. Consider taking ashwagandha, an herb from India that has scientific studies behind it to help you lower stress, which includes lower cortisol levels. When it comes to reformulating the way you eat, however, one thing is very important: Eat regularly and stay hydrated. 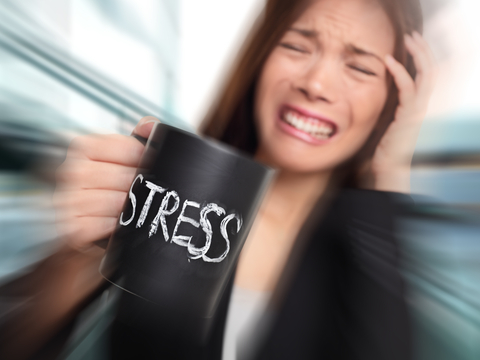 Being hungry or dehydrated raises your stress level! So, develop a nutrition schedule, and stick to it. While you don’t want to consume excess calories, you can and should divide your daily intake into several meals at regular intervals. Avoid going six hours or more without eating. We all get it. When you come home from work, you just want to crash. But that’s the worst thing you can do, especially if you have a desk job or a very stressful job. Exercise will lower cortisol levels, improve your mood, and help you sleep. According to Livestrong.com, 20 to 30 minutes of aerobic exercise a day can make a big difference in your cortisol levels. Something as simple as a moderately-paced walk around the neighborhood—or the local mall, if that’s all you can do—every evening can make a big difference. But try to get outside. Do you have a zoo or park nearby? Great! Grab a friend—furry or human—and go for a walk to lower cortisol levels in both of you. Other aerobic activities include stair climbing, bicycling, and running. Your goal is to get your heart and lungs pumping. We need six to eight hours of sleep each night, and cortisol levels naturally drop when we are asleep. We also need a sleep schedule, such as going to bed each night at 10 p.m. and waking at 6 a.m., to help us lower cortisol levels. A 2017 study from the University of Leeds found that adults with poor sleep patterns are more likely to be overweight and experience poor metabolic health. Those who slept six hours a night, on average, had a waist measurement 3 cm greater than those who slept nine hours per night. Quality sleep is important as well. If you’re waking up frequently during the night, you’re raising your cortisol levels. A 2017 study from Johns Hopkins University showed that untreated sleep apnea, for example, raises blood sugar and stress-hormone levels, including cortisol. Avoid looking at blue screens prior to bed. Don’t drink alcohol prior to bed. Keep the room dark and cool, at around 65°F. Exercise several hours prior to going to bed. Avoid reading or watching television in bed. Stop drinking water a couple of hours prior to bed. Don’t eat a big meal immediately before bed. A 2016 study from Drexel University found that as little as 45 minutes of art creation—whether it’s great art or not—can significantly lower cortisol levels. Although the researchers believed that past experience in creating art might amplify the activity’s stress-reducing effects, their study found that everyone benefits equally. So, get out those coloring books, Play-Doh, or just a blank piece of paper with some colored pens or pencils, and create your own masterpiece. While many people scoff at the idea of meditation or mindfulness, which is rapidly gaining a following due to its effectiveness and simplicity, the bare-bones fact of the matter is that these techniques help you relax, and that will help you lower cortisol levels. You can see the article by clicking here. The photos are descriptive, and the how-to instructions are short and to the point. We believe you can combine going for a better night’s sleep with relaxation to help you lower cortisol levels. add, aerobic exercise, alcohol, anxiety, apnea, ashwagandha benefits, battling depression, belly fat, blood pressure, blood sugar, calories, chamomile tea, chocolate, complete protein, cortisol, cortisol symptoms, depression, diet, exercise, feel tired, feel tired all the time, fiber, fitness, garlic, green tea, health, health news, high cortisol, high cortisol symptoms, hormone, how to lose weight, how to lose weight while sleeping, Lose Weight, lower stress, meditation, mindfulness, mood, nutrition, poor sleep, protein, protein sources, quinoa, sleep, sleep apnea, sleep quality, sleep schedule, stress, stress and anxiety, sugar, tired, tired all the time, university health news, untreated sleep apnea, vegetables. “Force yourself to relax.” Wow. Just wow. Next up: Depression–cheer up already! First, I’m glad to see I’m not the only one who thought the suggestions were ridiculous. About the food intake. Are you suggesting one should eat at “regular intervals” even when one isn’t hungry? Also, the recommended sleep is 6-8 hours, so obviously someone isn’t getting up to eat during that time period. Do you see the contradiction? Also suggested is aerobic exercise; cardio increases coritsol, thereby creating stress. What do you recommend for people who cannot do cardio just yet?